(Note: the content of this post first appeared in the MountainWeather column in the Jackson Hole News & Guide on July 20, 2016). Every summer I feel obliged to reiterate a few important points about lightning safety. Maybe this will be your first time hearing this message, or maybe an annual reminder isn’t such a bad thing. In a previous post, I outlined what to watch for, as far as cumulus clouds developing into a potential thunderstorm. Vigilantly observing the sky throughout the day is the first step towards knowing when it is time to retreat from the mountains, get off the lake, or the local ball fields. In this post, I will cover what to do when thunderstorms are imminent, and Mother Nature says it’s “game-on” for dangerous lightning. Most people are not killed by a direct hit from a lightning bolt. Although, that certainly would do the job and be “game over”, right there. 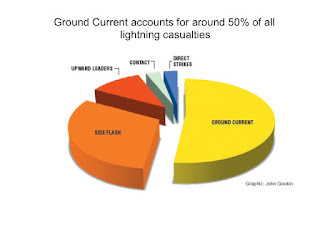 More commonly, people are injured or killed when lightning strikes nearby, causing an instantaneous surge of electrical current, and intense heat, known as a “side-flash”. The most common cause of lightning casualties, however, comes from getting shocked by the high voltage current that runs through the ground. Ground current accounts for about 50-percent of all lightning casualties. Look at it this way; a lightning bolt is like a hand-grenade going off. Standard Army-issue hand grenades have a kill-radius of about 25-feet, and a casualty-radius of about 50-feet. Therefore, getting to a safe, or safer location, where lightning is less likely to hit is your next line of defense. As soon as you can hear the thunder, lightning is close enough to strike, and it is time to seek shelter. Lightning bolts can be seen from about 15 miles away, and thunder can be heard up to about 10 miles away, on a good day. In a canyon, out in the wind, or at a noisy concert, thunder may not be heard until it is much closer. You can estimate how far away the lightning is by counting the time between when you see the flash of lightning and when you hear the thunder. Count in seconds (one-thousand-one, one-thousand two, etc.). Five seconds equals one mile. If you count to 25, that means the lightning is 5 miles away, which is actually close enough to be able to reach out and touch you. Don’t wait for it to start raining before you think about seeking shelter, or for the first bolt to hit nearby, as most people tend to do. Inside a building or a car are the absolute safest places to be. Picnic shelters, a gazebo, a dugout at the ball field, are NOT good shelters from lightning. If you are out on a hike, don’t run underneath the biggest, loneliest looking tree for shelter, as most people also tend to do, especially once it starts raining. A better option is to get into a group of trees of similar height. Also, make sure you are not standing on top of any tree roots. If all else fails, get into a low spot in the terrain, that is not a watercourse, and crouch down. Like Army guys do when they dive into a bunker to avoid the grenade’s blast. If you are in the mountains, do whatever you can, as fast as you can, to get off the higher ridgetops. Waiting it out in a gully or low spot between ridges is better than nothing, but avoid a gully that might become a running watercourse when the downpour starts. And separate yourself from all metal objects, ice axes, climbing hardware, etc. Also, DO NOT get under an overhanging rock or in a cave. Electricity will often jump the gap that you are sitting or standing in when lightning strikes nearby. If you are on a lake or river, get out of the water and off the boat. Water is a great conductor of electricity! Get to shore and find a stand of similar sized trees to wait it out. The absolute best thing you can do to prevent injuries from lightning striking nearby is: KEEP YOUR FEET TOGETHER. Standing with both feet together will help prevent dangerous ground currents from running up through one leg and exiting down the other. You may feel a bump under your feet as the ground current passes, if both feet are together, but it is unlikely that you would receive a serious electrical injury. Secondarily, don’t huddle together in a group. Spread out, at least 25-feet feet apart, if not 50-feet apart, so everyone is not within the same kill/casualty radius. Cows and sheep tend to huddle together during thunderstorms, and often entire herds or flocks are killed because they are all linked together as one big conductor of electricity. It is best to remain in a safe location for 20 to 30 minutes after the last of the lightning leaves the area; to make sure that the thunderstorm is a safe distance away. It is really hard to convince people to wait a little longer. We usually run right back out to play as soon as the rain stops. Pay attention to the weather forecast each day, to see what the probability of thunderstorms might be. Be observant of the clouds as they develop during the day. And don’t wait until the lightning is flashing or the rain is pouring to turn around and head for a safer location.